To hunt means to pursue, catch, take, kill or harvest wild birds and wild animals (wild by nature, whether or not bred or reared in captivity), including any physical part of that species of mammal or bird. The hunting, possession, transporting of any species of wild animal or wild bird, or parts thereof, for which an open hunting season is not specifically provided, and except as provided in the fish and wildlife laws, is unlawful. It is also unlawful to take, possess, or needlessly destroy the nest or eggs of any wild bird. Wild Birds: A person may not sell or possess for sale a wild bird, except for the plumage of lawfully taken wild birds, and only if that sale does not violate regulations of the federal Migratory Bird Treaty Act. Finished Wildlife Products: A person may buy, sell, barter or trade legally obtained finished wildlife products, excluding federally protected wild animals and birds. Deer, Bear, or Moose: A person may, without a hide dealer's license, buy or sell naturally shed deer or moose antlers. The head, hide, antlers and feet of that deer. The head, hide, antlers, feet and bones of that moose. The head, hide, teeth, gallbladder and claws (not attached to the paws) of that bear. Note: Raw antlers and bear gallbladders may only be sold (including for money, barter, or trade) to a licensed hide dealer, and they must be tagged or accompanied with documentation containing the name and address of the person who legally killed the animal. You Need a Hide Dealer's License to: Commercially buy, sell, barter, or trade any raw, untanned animal hides (including fur-bearing animals) or parts of wild animals or birds not prohibited above. Any parts bought or sold may not be attached to wild animal or wild bird parts that are prohibited from being sold. Please refer to mefishwildlife.com for the latest changes to this license and the new reporting requirements. Except as otherwise provided, wild birds and wild animals may not be hunted from 1/2 hour after sunset until 1/2 hour before sunrise the following day. Exceptions: migratory game bird, raccoon, and coyote. Is accompanied by a dog. Uses a rifle or handgun of no greater power than one which uses .22 caliber long rifle ammunition. Loads the rifle only when dispatching a raccoon that is treed or held at bay by a dog or dogs and has been identified by a flashlight. As used in this section, "bait" means an animal, plant, or part thereof used to attract wild animals for the purpose of hunting. Obtain oral or written permission from the landowner or landowner's agent. Plainly label the bait with a 2-inch by 4-inch tag containing the name and address of the baiter. Clean up the bait site immediately upon landowner request; or if not requested, within 20 days of the last day the site is hunted. Hunt over another person's bait site without the baiter's permission. Place any medicinal, poisonous, or stupefying substance to entice any animal. Baiting or feeding of deer is prohibited from June 1-December 15, see Deer Hunting. Baiting and feeding moose and turkey is prohibited from September 1 to December 15. Baiting and feeding turkey is prohibited during the spring wild turkey season. Further restrictions apply to bear baiting, see Bear Bait. It is unlawful to discharge any firearm, muzzleloader, or crossbow, or cause a projectile to pass as a result of that discharge, within 100 yards (300 feet) of a building without permission from the owner or, in the owner's absence, an adult occupant who dwells in that building. This provision also applies to state-owned boat launches that are posted accordingly. "Building" means any residential, commercial, retail, educational, religious or farm structure that is designed to be occupied by people or domesticated animals or is being used to shelter machines or harvested crops. This provision also applies to state-owned boat yards that are posted accordingly. "Projectile" means a bullet, pellet, shot, shell, ball, bolt or other object propelled or launched from a firearm or crossbow. Exception: Persons target practicing on land that they own or have permission to use may discharge a crossbow within 100 yards of a dwelling, provided the projectile does not enter another person's property. Never bases identification upon sound alone, oreven upon sound combined with what appears to be an appendage of the wild animal or wild bird sought. Bases identification upon an essentially unobstructed view of the potential target's head and torso. Recognizes that sound and sight target- determining factors are affected by a number of other considerations including, but not limited to, the distance to the target, surrounding or intervening terrain and cover, lighting and weather conditions, the hunter's hearing, eyesight, and experience level, and other people nearby. It is unlawful to hunt while under the influence of intoxicating liquor or drugs. Possession of hunting equipment in the fields and forests or on the waters or ice of this state on Sunday is prima facie evidence of a violation of Sunday hunting law, unless the equipment is securely wrapped in a complete cover, fastened in a case, or carried in at least two separate pieces in such a way that it cannot be fired without the pieces being joined together (for the purpose of this paragraph, a firearm clip, magazine, or cylinder is not considered a "piece"). Bows and arrows must be kept in a case or cover if broadheads or field points are kept attached to the arrows. Exception: A person may possess hunting equipment on Sunday for legitimate activities such as target practice, sighting in rifles, etc. A person on the ground or airborne may not use aircraft (including drones & remote-controlled aircraft) to aid or assist in hunting deer, bear, or moose. While hunting, a person who is not in or on a motor vehicle may rest a loaded firearm or crossbow that is under their control on the vehicle to shoot only when the vehicle is not in motion and the engine is off. While hunting, a person who is on but not within an enclosed area or passenger compartment of an ATV or snowmobile may shoot a firearm or crossbow or rest a loaded firearm or crossbow that is under the person's control on the ATV or snowmobile to shoot only when the ATV or snowmobile is not in motion and the engine is off. A person may not have a loaded firearm or crossbow on a ATV or snowmobile when the vehicle is in motion or when the engine is running. While target shooting, not hunting, a person who is on but not within an enclosed area or passenger compartment of a vehicle may shoot a firearm or crossbow or rest a loaded firearm or crossbow that is under their control on the vehicle to shoot only when the vehicle isn't in motion and the engine is off. A holder of a valid Maine concealed weapon permit may carry a loaded pistol or revolver in a motor vehicle as prescribed by Title 25 sub 2001A. Persons who are at least 21 years of age, or are at least 18 years of age and a member or honorably discharged veteran of the armed forces or National Guard, may carry a loaded pistol or revolver in or on a motor vehicle if they are not otherwise prohibited from carrying a firearm. Upon contact with a law enforcement officer, a person carrying a concealed handgun without a permit must notify the officer immediately. Paraplegics and leg amputees may shoot from motor vehicles that are not in motion. Migratory waterfowl may be hunted from a motorboat in accordance with federal regulation. A person may shoot from a motorboat if that boat is not being propelled by the motor and forward momentum of the boat has stopped. However, the wanton waste law allows you to shoot crippled waterfowl from a motorboat under power on coastal waters and all waters of rivers and streams lying seaward of the first upstream bridge. Note: A loaded clip may be carried in a motor vehicle, but it must not be inserted in, or attached to, a firearm; a crossbow may be carried as long it is not cocked and armed; a muzzleloader is considered to be loaded only if charged with powder, projectile and a primed ignition device or mechanism. A person may not shoot or discharge any firearm, crossbow, or bow and arrow at any wild animal or bird from any public paved way (any road treated with bituminous or concrete material), from within 10 feet of the edge of its pavement, or from the right-of-way of any controlled access highway. It is unlawful for any person, while on a hunting trip, to negligently, carelessly, or willfully shoot and wound or kill any domestic animal or bird. Possession of a firearm or crossbow on public school property or discharging one within 500 feet of school property, except as used in supervised educational programs or by law enforcement officials, is illegal. 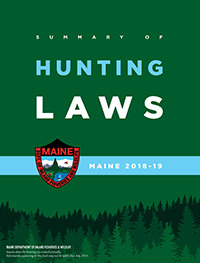 It is unlawful, except during normal field dressing or for baiting purposes, to dispose of the carcass, waste parts, or remains of a wild animal, unless you are on private property that you own, or property where you have landowner's permission to do so. For course listings, see Safety/Education Courses.